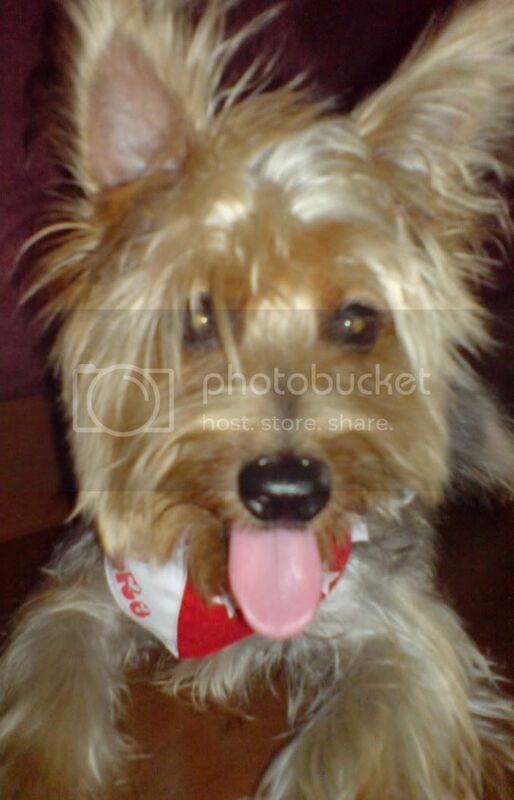 Yorkie Brothers with Tails: I don't thiiiink soooooo!!!!!!!!!!!!!! What in the world does nana think she's doing? Okay we can understand her need to dress Mom up. Come on who really wants to see their Mom nekked? Not us! Don't get us wrong we love our Nana but she has got to be stopped. We thought she was just going to make us hoodies and buy us t-shirts. But no she has to make these silly looking vests with velvet bellybands. All for the Yorkie christmas party. We are supposed to be getting a family pic done so she made Mom a matching dress. As if that wasn't bad enough then she decides to take pics of us in these getups. We are protesting to stay nekked. but u boys gonna look so cute wearing matching outfits with your Mom. I support you on your mission to stay nekkid, its much less demeaning! BUT you do look pretty cute!